As I mentioned on Friday, I have challenged myself to design and (hopefully) knit a pair of mittens for each month of 2014. I have been furiously working away at the January mittens (while re-watching every season of Dowtown Abbey). Here’s how far I have gotten. January is a cold, snowy month here in Minnesota. This year it is especially cold, today’s predicted windchills are -49F! 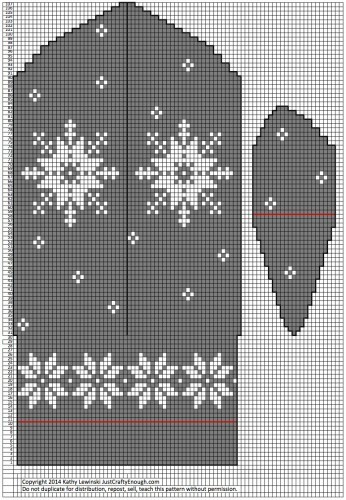 This month’s mitten celebrates those snowy days with a snowflake pattern knit up in soft grey and white. I strand the second color through the whole mitten, even when it isn’t used on a row, to give the mittens a warm almost double thickness. 1/10 and the mittens are finished! They were a really quick knit, just about a week from designing to finish. They are so warm and soft, I can’t wait to wear them out. A note about the yarn. I wanted to start these mittens right away, but couldn’t find a grey and white I liked locally in a sport weight, which is what I wrote the pattern for, so I took a chance and picked up a dk (light worsted) weight. I was still able to get gauge, but the fabric is quite dense without a lot of stretch. I like it for the warmth factor, but think these would have knit up a little easier in the sport weight. 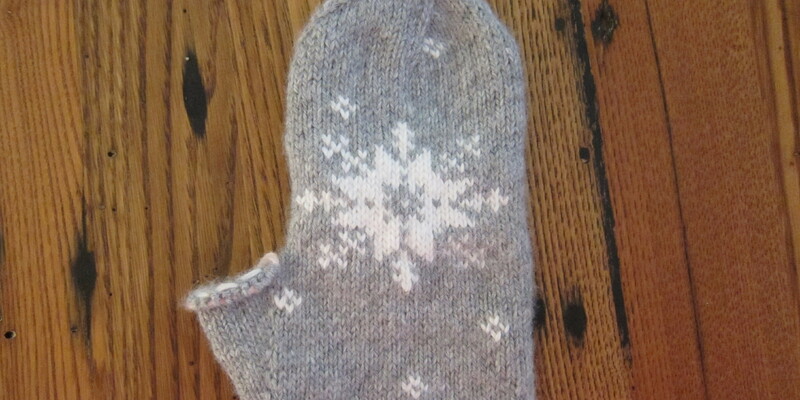 I’ll show you my completed mittens in a couple days AND I’ve already started designing the February mittens in my head. Follow the written pattern for construction details and the chart for color changes. Even though both colors are not used in every row I still like to carry the second color behind, twisting every three stitches, throughout the whole mitten (except the ribbing at the beginning). 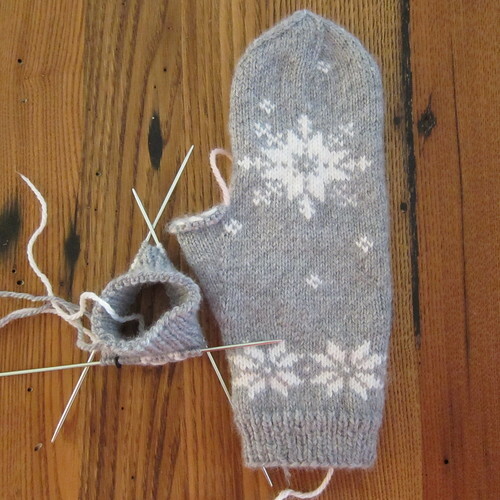 I feel like this gives the hand of the mitten a more consistent fabric and also makes them a little thicker for warmth. Your Make Ones (M1l and M1r) will look neater if you make sure not to twist your colors in that spot the row before you do that increase. Otherwise the second color will show through. With main color, cast on 56 stitches. Divide between three needles. Join together, being careful not to twist, and place a marker between the first and last stitch to mark rows. Remember to follow the chart for the design. Those are absolutely beautiful, Kathy. 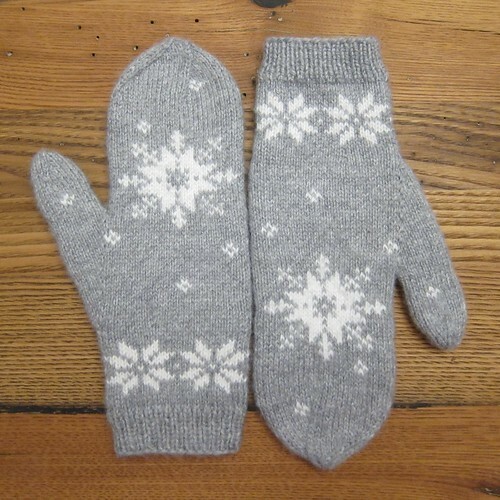 Lovely mittens. Thank you for the pattern!